5 Ways to Fall Into Helping them Develop While Having Fun! Fall is here in full force. I’m in the lucky position of having an amazing brother and sister (in-law) that give me lots of quality time with my nephew. But handing him over is always slightly more convincing when I’ve got something fun and educational planned. Whether your niece or nephew is transitioning into school for the first time or has headed back to grade school, it’s always nice to have a plan for when you see them. Here are five activities that are perfect for the fall! 1. “Collected Leaves” Collage: Babies can explore leaves on the grass or in a tub. Toddlers will love collecting leaves and placing them in a bucket with a handle. Children at this age can also stick the leaves to the sticky side of clear contact paper. Fold the contact paper in half, and have it around for continuous exploration or for use as a placemat. Preschoolers can point out characteristics that are the same and different between the leaves they’ve collected and can use glue to put them on to paper. Grade school children can use the library or internet to identify their leaves and learn about difference species. 2. Draw A Classroom Map: Drawing maps of your niece’s or nephew’s classroom is a great conversation starter and works on memory and processing skills. Preschoolers can draw the map with an adult. Ask them questions about what they do in their rooms. You might even ask his or her parents to take photos of different areas of the room to help you with the drawing. You can help them make a plan about what they might like to do the next time they are there. Older kids can create and label the map on their own. Let them explain to you what they do in each area of the room and what rules there are in each area. Where do they prefer to spend their time? 3. Go on a Letter or Color Hunt: I like to start this game with toddlers to support word recognition. Can you find the baby doll? Where is the bumpy ball? You can also work on directionality and following directions. Can you put the car on top of the chair? As children get a little older, ask them to find you something blue or point out an L. Make it trickier by adding steps: find something red, and put it under the table; then, bring me something green. Older preschoolers and grade-schoolers can use this game for phonemic awareness. What can you see that starts with a /p/? (Make the sound of the letter, rather than identifying the name of the letter.) For each game, let your niece or nephew take a turn being the leader. 4. Decorate A Pumpkin: Babies can explore the texture, weight, smell, size and—let’s be realistic—taste of a pumpkin simply by having it in their play space. Toddlers will love using Cray-Pas or face paint crayons to decorate them. Older toddlers can peel stickers for decoration, and preschoolers will love using paints. Children in elementary school can be supervised and helped, as needed, making a plan and carving a pumpkin with a safety knife. Remember that making a plan before any of these projects really helps to enhance the experience and teaches your nieces and nephews another important skill. 5. Taste Test Apples: Which type of applesauce does your niece or nephew like best? Which apple cubes make a toddler happy? What colors are they drawn to? Toddlers can smell and taste the apples while they’re whole and once they’re cut. Let them watch while you use an apple slicer. Older toddlers and preschoolers can help cut the apples and make a graph of which ones they like. This is a great way to introduce new foods. Certainly, children love apple picking for a fall activity, but even going to pick out a few varieties at the grocery store can be fun! Children in elementary school can chart the different types of apples and use descriptive language to explain the texture, taste, and their preference. As you engage with the children in your life, ask questions and encourage them to do the same. Show that you value investigation, and model how to find answers. Give younger children the opportunity to explore the world around them. Watch closely for their reactions, and you’ll gain some insight into the kiddies in your life. Most importantly, whichever activity you choose, whether one of these or one of your own, have fun! Dana Rosenbloom, M.S. Ed, is owner and therapist at Dana's Kids, a group dedicated to providing support and education for families with both typically-developing children, as well as those with special needs, who are struggling with developmental challenges. 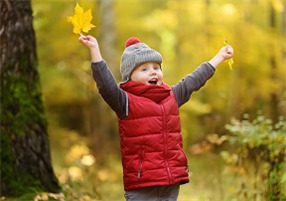 Home Expertise 5 Ways to Help them Develop with Fall Fun!